Deciding what to wear on a really cold winter day or night can be very challenging. You may feel like wearing your favorite dress or skirt for a girls’ day out or for a perfect date. But then, you realize it is chilly out there and you may catch flu! Well, why not try to layer your outfit in a way that you define the hotness quotient in the midst of your gang. All you need to do is get yourself some of the trending layer styles of this year. And here we have brought exactly that for you. Try these Smart Outfit Layering Ideas when it’s Cold AF. Don’t be doubtful! 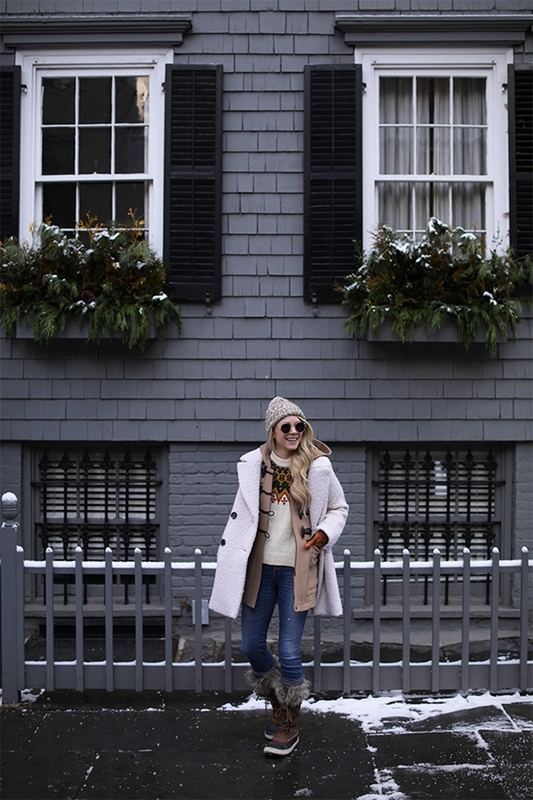 You can try out these layering hacks whenever you step out on a cold wintry day. And if camel coat is your favorite of all layers then you surely don’t want to miss this. Plan a whole day out by wearing a mini dress and putting on a long cardigan. It works well for the whole day and will keep you warm and cozy. You may also add some glamour to your look by getting yourself a pair of knee-high black leather boots. You can now wear your favorite crop top for a night to go clubbing. Just put on a bomber jacket over it and pair it up with some black ankle high boots. Wear a sable coat over your T-shirt. They are easy to move about in and are very comfortable. Blue denim is perfect to wear with these. If you are not much of a fan of heels or you are just not in a mood to wear them, here’s how you can pair your outfits with your favorite sneakers. This new trend of wearing smoking coats for a daytime outfit is super stylish. Wear anything under these Smoking Coats and you are good to go. Get more ideas about how to pair such hot jackets with your outfits to look chic this winter. Go bold by layering your plaid sweater with a stunning black Jacket. Make sure its length is till your knees which will give an edge to your look and accentuate your curves. Just as keeping your body warm throughout the day is important, taking care of your hair is equally important too. Or else, a wrong color and there you get those frizzy curls. Want to wear your skirt? Well then combine it with a silver glitzy jacket and chain it up. You will look vibrant and chic. Or do the reverse and pair silver skirt with a jacket. You will still look dazzling. Shine along a bit more and show off your cool nails with these cute nail arts. Feel like putting on some vibrant color? Get a vibrant green dress coat and wear your black heeled boots with it. Wear a woolen loose red sweater with your straight cut denim and chocolate brown boots. Wear a beanie if it is a bad hair day. You will look hot in this chilly weather. Step out by wearing a turtleneck long sleeve shirt with an olive collared jacket. Its old school but a classic combination. These jackets will make a great outfit for your work. Learn more about winter work outfits that you could try this season. Cover it Head to Toe! Need to cover yourself up? Layer your cool attire with a head to toe quilted jacket and put on the hoodie. Get out on the streets and make heads turn. Step out on a cold day with a bright blue velvet jacket and some blue denim. Let loose your hair and enjoy the winter breeze. You can wear you white faux fur coat on a snowy day. It will keep you warm and make you look smart on the street. You can pair it up with some comfortable jeans and heeled boot shoes. Being in style even on a really chilling winter day can be easy if you know how to layer yourself not only with the easiest outfits to wear but at the same time gorgeous accessories. You can wrap yourself in exquisite mufflers around the neck or wear caps that complement your outfit. Keep your boots clean and preferably wear them in the shades of black or chocolate brown. Since it is winter, you may wear vibrant lip colors and comfortable eye wears. Be confident about whatever Smart Outfit Layering Ideas you wear and slay your style of fashion. Also, be ready for the spring this year with a perfect wardrobe because it will be here in no time.